"The best play in London," said Harold Hobson in The Sunday Times, and other critics agreed. Robert Gellert, in The New Statesman, praised its "nervous and sophisticated brilliance", and Kenneth Tynan found it "a series of grotesque and disturbing observations on the nature of illusion and reality." One of the five characters in the play says "The problem of identity has been the hobby of the intelligensia for at least two millenia", and it is this problem which the play explores, the problem being made concrete in the person of the hermit. He existed in real life: Alexander James Cameron of Great Canfield, Essex, who lived as a recluse for forty-two years. Why did he choose to live like that? Was he different from us? Was he an idiot or a saint or a dirty old man? A playwright called Rudge, and three actors called Lizzie, Meff and Dust, take the stage in order to work out an answer, and revolve round the hermit like moths round a flame. The existence of Alexander James Cameron first became generally known when Raleigh Trevelyan wrote his biography - The Hermit Disclosed. Mr Trevelyan has now written the foreward to James Saunder's play. In publishing the play we hope that it will reach a wide new public who may not have had the chance to see it, and we are confident that the public will find it as exciting, amusing and lyrical as did the critics and the audiences in the theatre. "No matter how I reach out towards you or you reach towards me, we are still locked in our skulls as before," says Rudge early in this play. Can we ever find a purpose in another's existence? Have we any right to attempt to do so? The man who inspired the theme of Next Time I'll Sing to You - the exploration and acceptance of man's inescapable solitude - was Jimmy Mason, the hermit of Great Canfield, Essex. For half his life he had been seen by virtually no one except his brother Tommy, who brought him food. On January 17th, 1942, he died in his barricaded hovel at the age of eighty-four. His birth was an "accident". As a young man he had been brutally treated by his father, an ex-Indian Army sergeant. Jimmy believed that not only had Tommy poisoned his father, but that he had tried to poison him also. Before moving to his hovel he kept a diary, in which he recorded the behaviour and conversations of passers-by. Not really having been entirely of this world, he was forced to make deductions from what he saw and heard, without experience to guide him. His particular favourite was a little girl, whom he nicknamed Fanny Bell and for whom he left presents and flowers at the gate. He never, however, actually spoke to her. When Fanny grew up, the presents continued and she used to ask for money. Later the legend became current that Jimmy had been crossed in love and for this reason had forsaken civilisation. And here I come in, even if indirectly; for I wrote a book about Jimmy, A Hermit Disclosed. After seeing and reading Next Time I'll Sing to You (words actually spoken by the Hermit to the Rector), I almost feel that to admit this fact is a confession. James Saunders set out to write a play connected with my book, but it developed into something quite different. Why, he asked himself, should anyone write a play, or a book, about a lonely, neglected, grubby old man, a paranoid schizophrenic, who apparently contributed nothing to the world? This is not the place to defend myself, but it is true that, although my quest eventually changed course, from my schooldays onwards I was obsessed by my search for the reality of Jimmy Mason. I tried to find out why he had become a hermit, what for instance were his feelings towards Fanny, whether he could even have been a miracle-worker. But back to the play. "There lies behind everything a certain quality which we may call grief," says Rudge. By this time in the play, the caperings of Meff, the naiveté of Lizzie and the cynicism of Dust have fallen into shape, and we realize that apparent non-sequiturs have been vital to the whole development of the theme. The appeearance of Rudge brings in a new, intensely moving element, that of anguish and rebellion. Man, says James Saunders, is not free. He is powerless to resist his destiny, which is to end in extinction. No one sees the hermit's suffering, "no one gives a damn and there's no reason why anyone should". And it is left to Lizzie to have the final word: "One thing about us - at least we're not dead ..."
The play begins as a search for the meaning of the life of one man, the Hermit of Great Canfield, who spent his last 36 years living in a hut in a field, cutting himself off from the outside world; but as the investigation proceeds it is suggested that we are none of us so very different: we are all essentially alone inside our skulls, and life in general is pretty meaningless. These gloomy conclusions are reached in exhilarating - often hilarious - discussion, mingling crisp wit and brilliant passages that are deeply moving. Though at first sight an incoherent anti-play, it is in fact carefully shaped and full of effective 'theatre'. 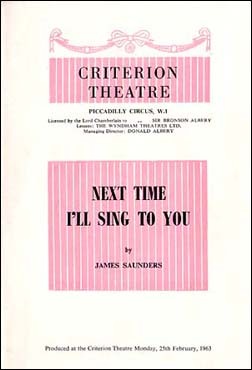 Saunders experiments with his characters as he does with the medium, trying to find out more about the basic components of their existence and their motivations. In Next Time I'll Sing to You, Rudge is doing all he can to reach an understanding of the Hermit. "All I want to do is understand the purpose of existence; of one man - not of the population of Liverpool, you understand, just of one man." "Examine him and we shall see ourselves." Like other exponents of the theatre of the absurd, James Saunders feels that the senselessness of life cannot be adequately expressed by a rational approach. The four plays in this volume have been widely acclaimed for their combination of understanding and humour. They explore different aspects of the breakdown in communication between human beings and make an abrasive comment on the hypocrisy to be found in our public and private lives. The best play in London... It has remained with me ever since: I am unable to forget it. Its ostensible hero is an historically authenticated hermit who died in Essex at the age of 84, after spending 36 years in voluntary solitude behind a barricade of ditches and fences; but he is merely a peg upon which Mr Saunders hangs a series of grotesque and disturbing observations on the nature of illusion and reality... A witty and gifted writer has unquestionably arrived.